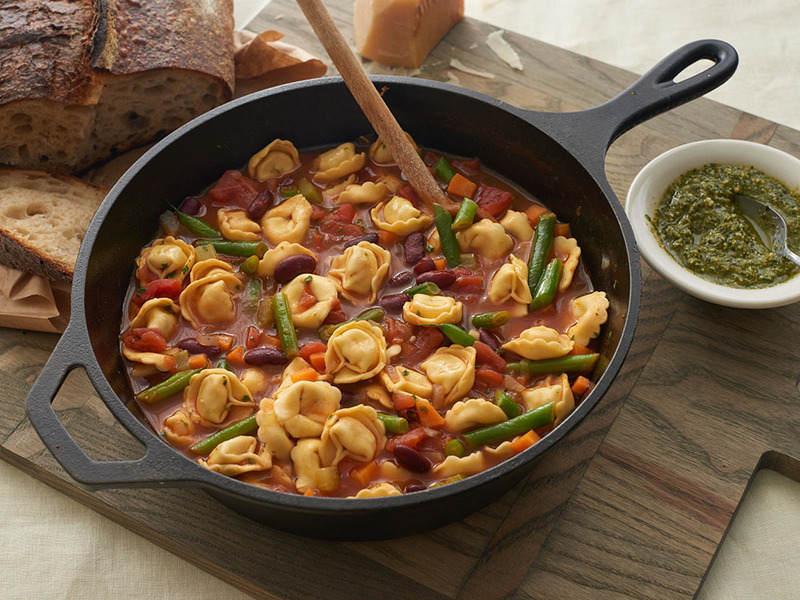 In honor of Lent, Three Bridges — a chef-crafted pasta, sauce, and meal brand that makes clean eating easy—are sharing meat-free recipes to enjoy on Lent Fridays. Here is the second in the series. Hope you enjoy! In a large sauce pot, heat the extra virgin olive oil over medium heat. Add onions, carrots, celery and sauté for 5 minutes. Add the garlic and stir for 30 seconds until it releases its smells. Then add green beans, Italian season, and salt & pepper. Stir and cook 3 minutes. Add tomatoes and broth. Bring to a boil over medium-high heat. Cover and boil for 10 minutes. Add kidney beans and cook 5 minutes. Add in Three Bridges Triple Cheese Tortellini and continue to cook an additional 5 minutes stirring occasionally. Stir and remove from heat. Serve each bowl of soup topped with a sprinkle of parmesan cheese and a dollop of Three Bridges Pesto Sauce. Enjoy!